Apple did release a couple of new iPads already this year which offer nice but little improvements over the previous generations. The biggest announcement concerning iPad was made during the company’s developer conference. With iOS 11 Apple is going to release a huge software update for its devices. According to their own statement, it’ll be “a giant step for iPhone” but “a monumental leap for iPad”. While the final rollout won’t start until fall this year, Apple just released a public beta which everybody can download using this link. I already installed the iOS 11 beta on my 2017 iPad and took a closer look at all the new features. There are tons of new features introduced with iOS 11 – especially for iPad. Here are the most important ones which bring us one step closer to using an iPad – mainly an iPad Pro – as a full laptop replacement. One of the best new features in iOS 11 is the new dock that on an iPad now works similar to the one in macOS. You can place any app in there and their algorithm is even suggesting you a couple of other ones depending on what you’re doing at the moment. You can access the dock any time by swiping up from the bottom. Yes, that even works while you are using an app, you don’t have to be on the home screen. Apple has been offering us some limiting multitasking capabilities in the past but now we’re getting a huge improvement. While using an app you can swipe up the dock and drag any app next to it. You can open it as a slide over or in split view mode. In split view mode, you can change the size of the windows similar to Windows 10 or Android 7.0 Nougat. If you load an app in slide over mode on top of it, you can have up to three apps open at the same time. The configuration is even saved in the app switcher. Starting in iOS 11 the app switcher and control center are the same thing, placed in the same interface. By swiping up you get the dock, by swiping up a bit more you’ll launch into the app switcher. Inside the app switcher, you can go back to any app you’ve opened recently. As mentioned earlier that even goes for split view configurations. On the right-hand side is the control center from which you can quickly control your WiFi, Bluetooth, and other settings. You can also control the brightness, volume and even configure it a bit inside the setting – for example, to get a shortcut to the timer or alarm clock. Another very important new feature is drag & drop. With this, you can drop and drag files, pictures or links between new apps. For now, it does only word with Apple’s own apps but it should be supported by most once the final version of iOS 11 is available. Drag and drop works surprisingly well. For example, you can select an image with your finger and add other ones to the selection by tapping on them with another finger. While having your finger with the selection pressed down you can use another finger to open another app and just drop your selection in there. That’s kind of cool. I’ve been waiting for a files app since the first iPad was released. Now, in iOS 11, it’s finally here. With the files app, you can browse through all the files that are stored locally on your iPad. As of right now, you can only see the files saved from Apple’s apps but others should follow soon. Obviously, iCloud Drive is deeply integrated into this and that works very well. Apple promised us to include other cloud storage services as well including DropBox, Google Drive, and OneDrive. But right now the integration of them does not seem to be final, but at least you do have access to them. While you will be able to see all files saved on your iPad, like documents, pictures, and videos, you won’t have access to system files. So it is not as complex as similar features in Windows, macOS or Android – and it probably will never be. But that’s fine. Another feature is the improved keyboard. While it looks the same as before it is now easier to type numbers and special characters. Instead of switching through the characters by pressing a button you now can type an alternative character by swiping down on the key. For example: If you want to type a 7 you just have to swipe down on the “u” key now. That makes it much faster to type in passwords. With the notes app, we get a couple of improvements as well. The most interesting one is the ability to scan documents with the camera. That works surprisingly well. You just take a picture of the document and the app straightens it out and you can edit it – for example fill in a form with your Apple Pencil. You’ve always been able to take a screenshot by pressing the home- and power button on your iOS device. That did not change. But now you see a little preview in the lower left of your screen. If you open the preview you can actually crop the screenshot and or annotate it with your finger or Apple Pencil. A lot of competitors offer this – and finally, the iPad does too. 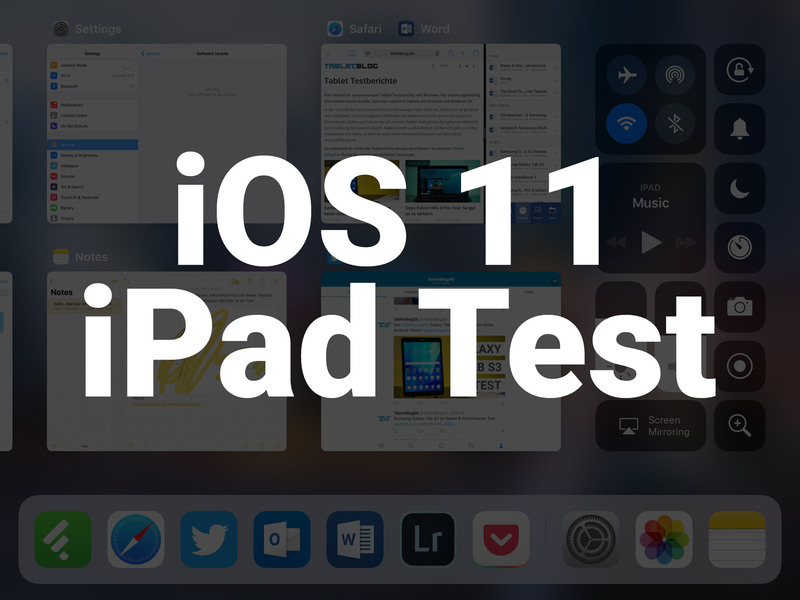 There are a lot of other improvements that Apple is introducing with iOS 11 for iPads and iPhones. These are the most important ones that make it easier to really get some work done with an iPad. What do you think of iOS 11? Did you try the beta?